Winter is coming to an end in Vegas and it's a great time to get outside and make sure your backyard is ready for spring. Here are some ideas to help you clean up and improve your outdoor living space before spring arrives. Ensure lawn equipment is working and ready. Check your mower's fuel levels and start it up so when the grass starts to grow, you'll be ready. Spring is a great time to plant in Vegas, thanks to the warming temperatures and rainfall. Just be sure frost season is over before you start planting or you might lose your plants. Mulch the areas around your shrubs and trees to help moderate the temperatures and keep moisture in. Check your shrubs and trees for dead spots. Use a pair of sharp pruners to remove any diseased branches, dead branches or growth that's crossing over one another. Remove any weeds that have grown over the winter months. If you have an abundance of them, think about putting down weed blankets. Hose off any patio furniture that was left out over the winter months. Remove grime, debris and dust, so you're ready to enjoy your yard when the warm days start rolling in. Think about how your indoor space works with your outdoor space. A retractable screen door allows you to enjoy your outdoor space more over the warmer months. Build or buy planters to place around your patio. Flowers and small shrubs can brighten up your outdoor spaces and help you shake off the winter blues. If you have a wood deck check to see if repairs or re-staining is needed. The end of winter is the perfect time to work on your outdoor areas. Invest in some shade. We all know summers can get brutal in Vegas. 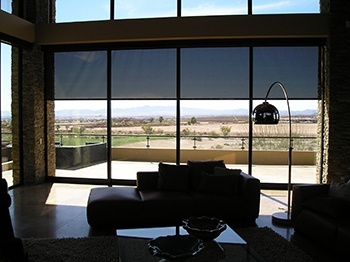 Before it gets too hot, consider having retractable shades installed around your backyard patio. What else is on your spring checklist?